Epiphanies—also sometimes called eureka or “aha! moments”—are those flashes of insight that are often part of the creative process. As discussed before, they tend to come when our minds are at rest and in a place of what has been called cognitive ease; diverted from trying to find a solution to a vexing problem we had been considering previously in a more analytical fashion. When we have an epiphany, we tend to know it right away, and there is a very pleasant feeling associated with that moment, and usually a sense that a real breakthrough has been achieved. Also of note, problems solved with insight do not occur in some step-wise incremental fashion; one goes from no conscious appreciation of a solution to the complete solution in one leap. Increasingly, neuroscientists have been studying these moments and some interesting findings have been made recently. In order to study epiphanies, neuroscientist rely on administering various tests that are typically best solved by insight, one of the most common being remote associates tests, or RAT. An example is to ask an individual to find a word that is associated with three other words. For example the correct solution to pine, crab, and sauce would be apple (pineapple, crab apple, and apple sauce). The tools used to measure the brain’s response to solving these insight problems are generally two: electroencephalography (or EEG, the recording of tiny electrical fluctuations on the scalp with electrodes) and functional magnetic resonance imaging (or fMRI, which detects changes in regional blood flow in the brain). They are complementary in that EEG has very good temporal resolution but limited spatial (anatomical) resolution, and the opposite is true for fMRI. Also discovered is that the state of mind one is in predisposes or primes the brain to solve a problem either insightfully or analytically. Analytical priming shows increased activity (decreased alpha-band on EEG) in the occipital lobes (the “looking out” to survey a threat from a predator, for example), while preparation for insight shows activation of the ACC and temporal lobes. The ACC is particularly interesting, as it seems to function as both a monitor of other brain regions and as a switch. In short, stimulation of the ACC seems to increase the relative importance of weakly activated associations (less obvious solutions or links). Previous research has suggested that the right hemisphere is particularly well suited for these types of connections due to its more lateral and broad semantic network, and that it contains both more numerous and longer (more distant) axonal connections versus the left hemisphere. Thus, activation of the ACC switches the brain into being more of an insightful problem solver. 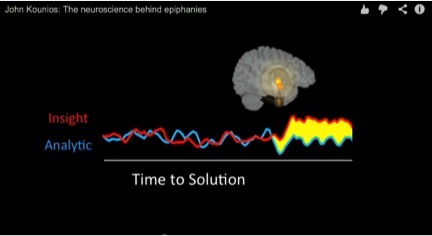 Also of note is the discovery that individuals more adept at solving problems with insight tend to have greater right hemisphere as well as diffuse visual cortex activity while at rest, and it’s the moments just prior to and during the solving of a problem with insight, that the switch is made to a more inward focus. This fits nicely with the ideas previously put forth in this blog that creativity involves intense curiosity (the data collection phase if you will—the outward facing time where one “looks up to the stars”) and then a desire to connect things in a novel way (the inward phase). As already discussed here, humor and positive mood in general (and the absence of anxiety) has been shown by cognitive psychological experiments to enhance insight, intuition, and other aspects of creativity. Are there any neuroscience correlates? There appears to be. For example, there is an observed electrical potential called the N400 that is elicited when the brain detects two sequential words (or concepts or stimuli) that may have some degree of relatedness or similar semantic context. A repeated theme to understanding creativity and insight is the notion that connecting ideas that are not obviously related is at the heart of the creative process. The N400 (as measured by EEG) tends to be larger when the brain determines two words, for example, don’t fit well together, and smaller when they are judge to have better semantic relatedness. Studies have demonstrated that when a positive mood is induced, words that are more incongruent (less obviously connected) elicit a smaller N400 potential than the same words in a neutral state. Positive mood and the absence of anxiety then appears to open our minds to allowing for more varied and broader interpretations of incoming stimuli. So both positive mood and as discussed before, small does of alcohol, improve our ability to solve problems with insight, but is there any other way to induce insight? Perhaps. Although still very early on, studies using simultaneous transcranial direct current stimulation (or tDCS, which is the application of low current to the brain via scalp electrodes) of the right frontal-temporal cortex and inhibition of the same region on the left, resulted in marked improved ability of subjects to solve problems that require insight. Creative Heuristics #5: Over the preceding decades, many observations and cognitive psychological experiments have been made that lend support to the notion that the right hemisphere of the brain takes the lead when we solve problems with insight, and have moments of epiphany. Although still early on, neuroscience is confirming these observations and helping us to understand how insight may be deliberately enhanced. * As previously discussed, the creative process as a whole (of which the moment of insight or epiphany is just one part) requires both divergent and convergent thinking, and thus is certainly a bi-hemispheric process. There are certain states of mind and mood that increase our ability to solve problems using insight, be they Aha! moments or more deliberate attempts at being creative. Perhaps the most famous anecdotal story of inspiration is Archimedes’ moment of inspiration that occurred while he was bathing. 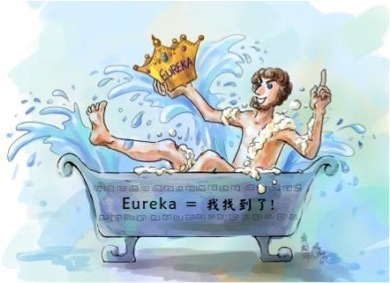 The ancient Greek scientist reportedly shouted “Eureka!” (meaning, “I have found it”) upon realizing that water displacement could be used to compute density, and thus he could solve the task of determining whether a crown of King Hiero II was pure gold or an alloy. As it turns out, activities like bathing and showering, or other tasks that promote relaxation and allow the mind to wander (a long walk in the country, fishing etc. ), are associated with such moments of epiphany. This is often referred to in the literature as ‘random episodic silent thought’, or REST. In his book Thinking, Fast and Slow, Nobel prize winner Daniel Kahneman discusses how being in a state of what he terms cognitive ease (as opposed to cognitive stress) allows our more intuitive mind (what he refers to as system 1 thinking) to function better. This comes at some cost to our analytic, or system 2 thinking mind however, and we tend to be less analytical and skeptical. This makes sense, as part of the creative process is withholding judgment and collecting a wide range of ideas and solutions (and will be discussed in a future Create Heuristic essay). Interestingly, being in a state of cognitive stress or anxiety in general, tends to narrow our scope of attention, and makes incorporating novel or broader stimuli less likely. There is evolutionary correlates to this as early humans would have been served well to focus on a threat from a predator, for example, and to not be distracted by less (immediately) relevant data. Going a step further, beyond just being at a state of REST or ease, in turns out that an upbeat, positive mood enhances our ability to think insightfully and this is true whether that condition occurs spontaneously or whether it is induced in a laboratory setting. For example, neuroscientist Mark Beeman and his colleagues found that showing a clip of Robin Williams doing stand-up boosted the success rate of solving insight problems by about 20%. Humor seems to allow the brain to make connections between weak associations—a key to creativity. As the brilliant comedian John Cleese of Monty Python’s Flying Circus and Fawlty Towers fame said, “the main evolutionary significance of humor is that it gets us from the closed mode to the open mode quicker than anything else.” Another fascinating finding is that humor is a two way street: positive mood enhances insight, and solving problems with insight enhances mood. Apparently, we enjoy being creative! Creative Heuristic #3: Foster a culture of innovation and original thinking by encouraging and promoting good “creative hygiene”. Inspiration and creative insight can be augmented by allowing the mind to be well rested and free to wander, and be in a state of cognitive ease. Positive mood and humor—and the absence of anxiety—further enhance our ability to be creative. And when in doubt, add a glass of wine to the mix!